Doncaster Rovers Belles are keen to secure the Women's Super League Two title after sealing promotion to WSL 1, says striker Courtney Sweetman-Kirk. Both Belles and Reading Women won on Sunday to guarantee top-tier football in 2016, with the title set to be decided between them. "The pressure's off now," Sweetman-Kirk, who has scored 20 goals in WSL 2 this season, told BBC Sport. "We've done what we were meant to, but it's half the job." 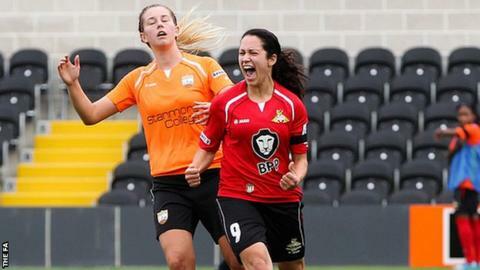 The former Notts County Ladies forward added: "We want to go up as champions and I'm sure Reading do as well." Reading are second in the table, three points behind the Belles, but with a game in hand on the leaders. And with a lesser goal difference of four, Sweetman-Kirk says Doncaster will look to score as many as possible in their remaining two fixtures, in case the title is settled on goal difference. "Our last two games are at home and we'd like to fancy ourselves against the teams that we've got," she said. "Our scoring record has been outstanding throughout the season so we'd like to think that we can win those games by a few goals. "We could be champions and that would be fantastic."